Real Madrid are reportedly willing to break the goalkeeping transfer record for Manchester United’s saving hands, David De Gea. Reports in Spain claim Real manager Carlo Ancelotti is looking to replace the departing Iker Casillas with his fellow countryman, who moved to Old Trafford in summer 2011. The Italian is optimistic De Gea can attain similar legendary status as Casillas at the Santiago Bernebeu and is willing to break the bank for his services. 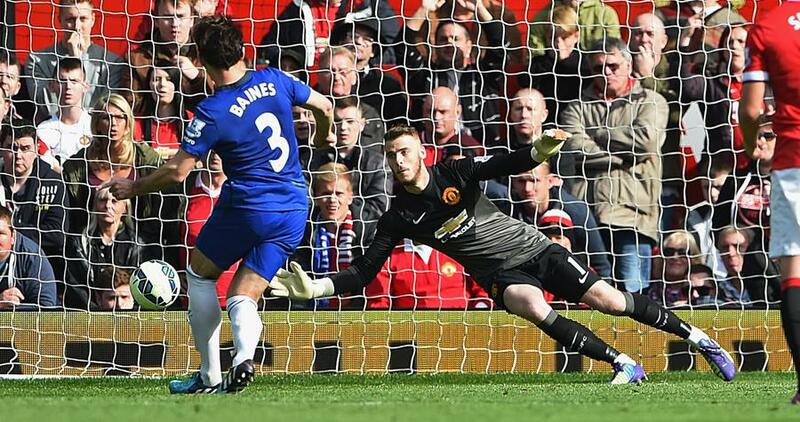 David de Gea Saves Leighton Baines’ Penalty in United’s Win Over Everton. Image: Getty. The standing record for a goalkeeping transfer is the £33m Juventus paid Parma for Gianluigi Buffon in 2001 and it is understood the Spanish giants are willing to top that. De Gea has been sparing United’s blushes with tons of terrific saves. His eight saves against Liverpool is a total that has not been beaten this season in the Barclays Premier League, despite having been replicated five other times- one of those by the 24-year-old in the 2-1 win away at Arsenal. De Gea’s current contract expires in the summer of 2016, after which the Madrid giants will be able to open pre-contract with the capital city native. In the meantime, united remain confident that their coveted goalkeeper will soon put pen to paper on a new deal. However, they have yet to formally announce whether or not contract talks have taken place. The Old Trafford club currently has Victor Valdes at their Carrington facilities but for training sake.